The Tahoe Transportation District was created in 1980 with the revise of the bi-state compact that also governs the Tahoe Regional Planning Agency. Its task was straightforward: protect the lake and get needed improvements on the ground. To put it simply, the TTD was designated the implementer of transportation plans and projects. That mission was further clarified in 2010 when a bi-state water quality study found that more than 70 percent of the particulates impacting the lake originate from the transportation system and built environment. In the last seven years, since I joined the organization as executive director, that implementation has focused on five major projects: the roundabout at the intersection of state Route 28 and 431 in Incline Village; the Nevada Stateline to Stateline Bikeway and state Route 28 corridor management plan; the realignment of State Route 89 and rebuild of Fanny Bridge in Tahoe City; the U.S. 50 Community Revitalization in South Lake Tahoe; and a north/south ferry connector across the lake. The number seven is significant. It is the average norm for the planning and completion of transportation projects around the country. It was not the norm for Tahoe. But in the last seven years one of the five projects has been completed, three are in construction, and the ferry and U.S. 50 are in the planning stages. Some of these project ideas had been around for decades with no real consensus or forward movement. What did they lack? Recognized community value. Where we have been most effective as a transportation district is in our listening skills. Projects must add value and we only reach that stage by listening and allowing the community to help shape the solution. What does that mean? It means time. The Tahoe Transportation District spent two years in Incline Village to hear concerns, craft solutions and build acceptance for the Incline Gateway roundabout that was completed in October 2012. Democracy is not cheap, but it is crucial to success. Finding solutions to the traffic, environmental degradation and pedestrian safety issues from Incline Village to Spooner Summit required the collaboration of 13 area agencies and a funding approach that pursued several angles. The traffic and parking issues along this corridor had been around for decades, but the different groups were at an impasse. The TTD convened all of the groups that had some part in State Route 28 to broker a solution. We inventoried all of the parking spaces, all of the trails and found access was the major issue. We needed a full corridor approach and that is the only way to get things done in Tahoe — teamwork. Construction began in August on the first 3-plus miles of the overall 13-mile Coordinated Management Plan. A shared-use path to Sand Harbor, park-n-ride lots and paved spaces are being added in conjunction with East Shore Express transit service to provide access. The project, funded by federal, state and local dollars, is scheduled for completion in 2018. The TTD spent several years working collaboratively with Tahoe City residents, agencies, and business and property owners to come up with a final design that would address traffic congestion entering and leaving Tahoe City and the West Shore and rebuild the 88-year-old aging Fanny Bridge. At least six alternatives were considered along the way. The final choice goes way beyond a road improvement. It includes a new bridge and three roundabouts to improve traffic flow and provide an additional entry and exit from Tahoe City’s West Shore, an upgrade to the more than 40-year-old sewer pipe line from Tahoe City to Truckee, new sidewalks, street lamps and other beautification and safety upgrades. A construction contract was awarded in October and initial work will begin this winter. It now addresses affordable housing, safety, economic development, pedestrian, bike and transit needs, as well as environmental improvements, all the while matching up with local area plans. Lofty goals? Yes. Needed improvements? Definitely. In fact, it is designed to integrate with numerous existing and planned projects to come: Stateline to Stateline Bikeway, Van Sickle Bi-state Park, transit shelter, water quality and pedestrian improvements from Ski Run to Trout Creek, Lake Tahoe Passenger Ferry Project, and more. Where are we at? Five alternatives are in the environmental analysis stage and the environmental document is awaiting agency approvals to release to the public and begin the decision process. The TTD board has adopted guiding principles for this project regarding right-of-way, housing, construction, support for affected businesses and continued community involvement. One of the board’s most significant commitments is that construction of replacement housing will be the initial focus of the project. After the environmental document is certified and a preferred alternative is chosen we can go into the planning and funding stages. There is $6 million in federal money already secured for design and construction. Douglas County passed a nickel-per-gallon tax this year with a portion of it earmarked for transportation and this project. With these documents complete we can also start to solicit proposals from private investors for the housing portion. Just like the projects before it, U.S. 50 revitalization will require a village, and just like the others it is part of a greater picture for the Lake Tahoe Basin. 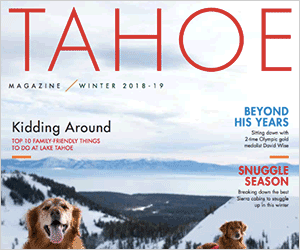 The puzzle pieces are falling into place for a better, environmentally positive and connected Tahoe.